Hey Honolulu! Global Game Jam 2018 is just around the corner, and we couldn’t be more excited! This year’s jam will be at the University of Hawaii’s iLab from 5:00 pm on January 26th to 5:00 pm on January 28th, and we’re hoping you’ll join us! Step one: Make sure to register for the Honolulu jam site! 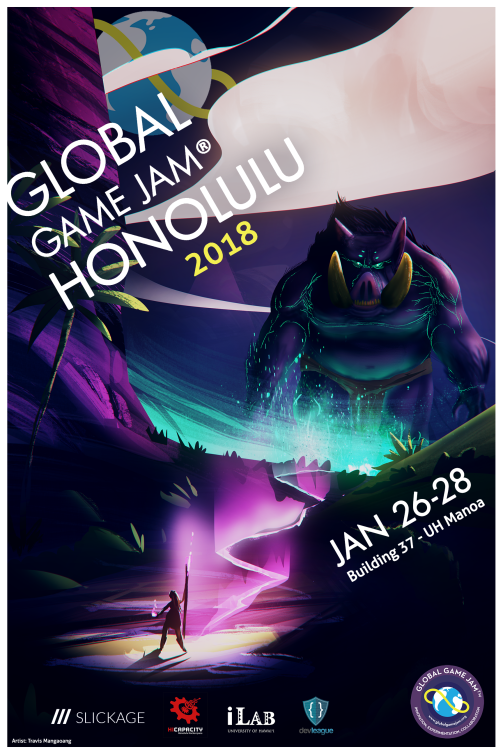 Step two: Join the Honolulu Global Game Jam Discord! Hello everyone! I’ve been posting some updates on Facebook but wanted to get an official release out there. Our last day at MIC will be August 31st. We anticipate that the space will officially reopen at iLab the week of the September 11th. We will be announcing the exact day soon. The gap week in between will be used to setup and organize everything. We are working hard to purge the current space of trash and e-waste. The majority of the items we have decided to keep have already been moved down to iLab. Most of our larger furniture such as shelving and lockers have been removed. We are trying very hard to have everything out by the end of the month. If you have personal items at the space we ask that you take it before Thursday. If you still hold a HICapacity key card please make arrangements to turn it in. If you are unable to make it to Manoa please let someone know and we will try to get it from you. Those of you who have access to other suites in MIC may keep your cards. We are looking to plan a open house for our reopening. It will be open to everyone to come down and check out our new home. Details will be announced in the coming weeks. We want to thank everyone who has been assisting us in moving and those who are helping us clean out. This is always a process and we are grateful to get all the help we can get. Smaller updates are occasionally posted on Facebook if you want more details. Thank you all again and we’ll be in touch soon! Hello everyone! We’ve been a little quiet as of late but we’re still kicking! Today we have an exciting announcement that will shape the next chapter of HICapacity. It was about 3 years ago that we announced that we were moving to MIC. Today we’re officially announcing our departure from the Manoa Innovation Center. But where are we going you ask? We’re partnering with the iLab at UH Manoa and will be moving in with them! We will be located on the UH Manoa campus close to campus center. You might be wondering why we decided to do this partnership. We’ve always dreamed of attracting student makers and helping to mentor them as they grow. This is the perfect opportunity to connect with them. We will be sharing the iLab space so students may be in the lab during school hours and we would encourage everyone to mingle with them. HICAP will have a small room to use for its equipment but we are free to use the common area. There are tables and chairs (and sitting areas) that can be used when using laptops. With all of our spaces there is always the question of parking and access. At this time, before 8:00 PM parking will have to be paid for at the UH parking structure. The green marked stalls outside of iLab are free after 8:00 PM on weekdays and all day on weekends. You can try to find street parking along Dole Street but this can be full depending on the students. There is also the question of access. Members who wish to have a key card will be issued a key card upon request. Just a note that there is AC on the weekends! So what’s next? Starting this week we will begin preparing for the move. I will be working with Jesse to ensure the current space is cleared of trash and that only essential equipment be brought to iLab. We will likely begin tagging items as we did during our last move. Jesse has made a list of equipment that is for sale or up for donation as we clean out our current space. The list will be publically released soon and anyone in the community (including members) will be free to enquire about the items. We ask that any personal items be removed from HICAP as soon as possible (we will not be moving these items for you). We will be targeting the end of the month to be cleared out of MIC. We ask that members who currently have MIC key cards to turn them in by the end of the month. If you cannot find the key card MIC will assess you a $25 fee. You can either give the key card to the front office at MIC or leave it with myself or Jesse and we will turn it over at the end of the month. Things will be crazy for a while but feel free to continue using the current space at MIC. I will check back in again when the new space is open for business. We will also be coordinating a re-opening party at iLab so everyone can come down and check out our new space! Sorry for the long winded post, if you have any questions please contact Jesse, James, or myself. Hope to see you all soon!